The Gruffalo (Julia Donaldson) and This is Not my Hat (Jon Klassen) were evaluated by children this time. The Gruffalo was selected to be read first by the 6-7 year old children. The colorful cover portrays a small, smiling mouse and a large, smiling monster who is apparently our Gruffalo. The story that follows is colorful, rhyming, and repetitive though with a twist at the end as the peaceful mouse stays alive in the forest through tricking the predators who want to eat him. 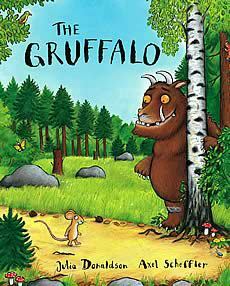 He successfully tricks a fox, owl, and snake by saying he is about to meet a Gruffalo, an imaginary monster whose description scares them, and upon actually meeting this Gruffalo, the mouse changes his story once again. He convinces the Gruffalo that he is the doesn’t taste ‘good’ but is the ‘scariest creature in this wood’ by returning along the same path where the fox, owl, and snake hide in fear upon seeing him. The Gruffalo believes this story and runs to hide from the mouse as well. The story ends with the mouse sitting peacefully in the woods eating a nut. Though I was afraid the students would not be able to follow the story, by the time we reached the end, several faces were smiling the sneaky smile of recognition and understanding. When I asked at the end about what the mouse had done, the students replied with relish that he was smart and had tricked the other animals. Though he was a trickster, often a trait attributed to a fox in animal tales, the children felt he was a ‘good’ character. Indeed, this theme of a small character (a mouse) having a hidden and significant trait is also in the classic Aesop’s folktale of The Lion and the Mouse. Rather than using his teeth, he uses his mind. This is Not my Hat, a personal favorite, was not attractive to the students, as they said, due to the dark (black) cover. The large simple illustrations often covered a double spread and sometimes contained very simple changes, like the opening of the big fishes eyes. The text of the story is a monologue of the little fishes justification of why he stole the big fishes hat which ‘fits him better’. Convinced he won’t be found, the little fish goes to hide in some seaweed, unaware that the big fish is following him. The story ends with the big fish entering the seaweed and exiting wearing his hat again with no sign of what happened to the little fish. Generally ominous, the children each had a different description of the ending. One said the little fish gave his hat to the big fish, another that the big fish ate him, a third that the little fish left. When I asked which story they enjoyed more, all the students pointed to The Gruffalo. Why didn’t they like This is Not my Hat? It’s dark, they said. Though the story contains no violence, angry words, or sign of animals eating animals (as in The Gruffalo), This is Not my Hat succeeded in communicating the graveness of theft. Between both books, The Gruffalo retold an old folktale in a very attractive manner to the children, even if they could not understand all the words. This is Not my Hat, using far less words, illustrates to them a strong lesson about theft, even if the children themselves can not verbalize it.